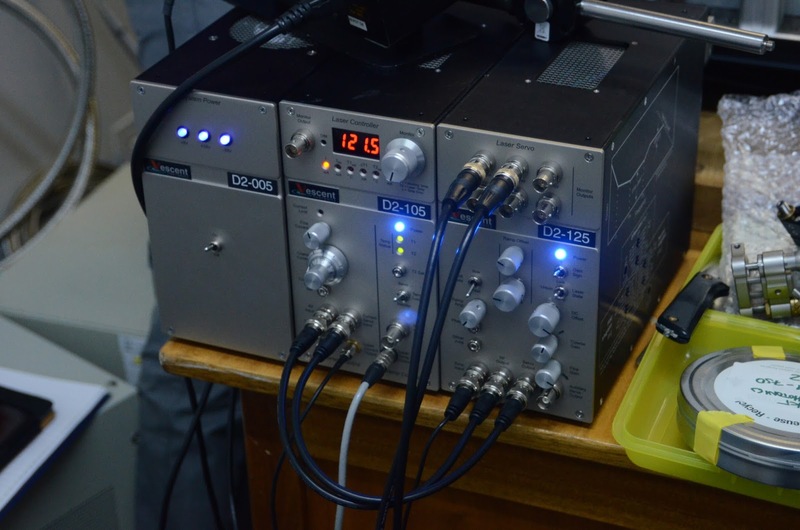 Richard's written a piece that neatly explains what makes the comb such a powerful wavelength calibration tool... Read all about it here! Even the stray light from the comb's spectacular! After an active day with the media and visitors, the night was quiet. Could not open due to rain, cloud, wind. Sub-zero temperatures. But looks much better for tomorrow. again, but had to close due to humidity before 11pm already. So how do these LFC things work? 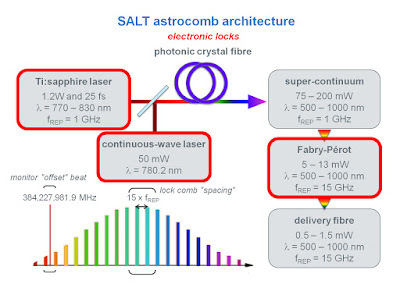 The 4 primary components of the comb are shown in the pic below: the titanium sapphire laser (1), a diode laser stabilised to a rubidium transition (2), a photonic crystal fibre for super-continuum generation (3) & a Fabry-Perot filter cavity (4). 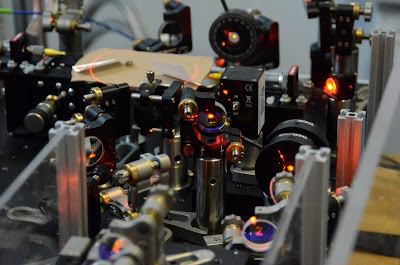 So at the heart of the system is a titanium-sapphire femtosecond pulsed laser. 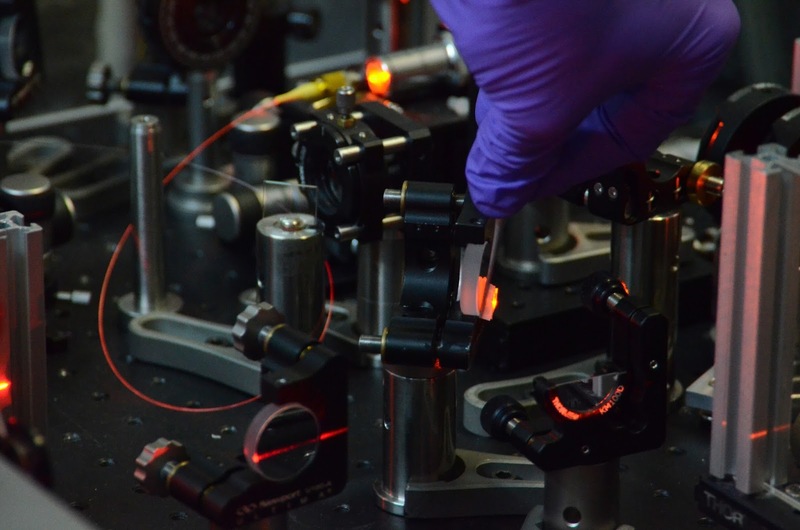 The Ti:sapphire crystal glows red/orange when excited by the laser light & the copper block that holds it needs to be water-cooled while the laser is running. 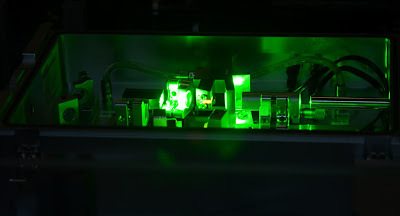 This main (Ti:sapphire) laser is pumped by a frequency-doubled, continuous wave, neodymium-doped yttrium orthovanadate (Nd:YVO4) laser that's powered at 6 W. Frequency doubling of the Nd:YVO4 converts the invisible infrared light (at 1064 nm) to the characteristic green light at 532 nm that's needed to produce the red (800 nm) Ti:sapphire beam. 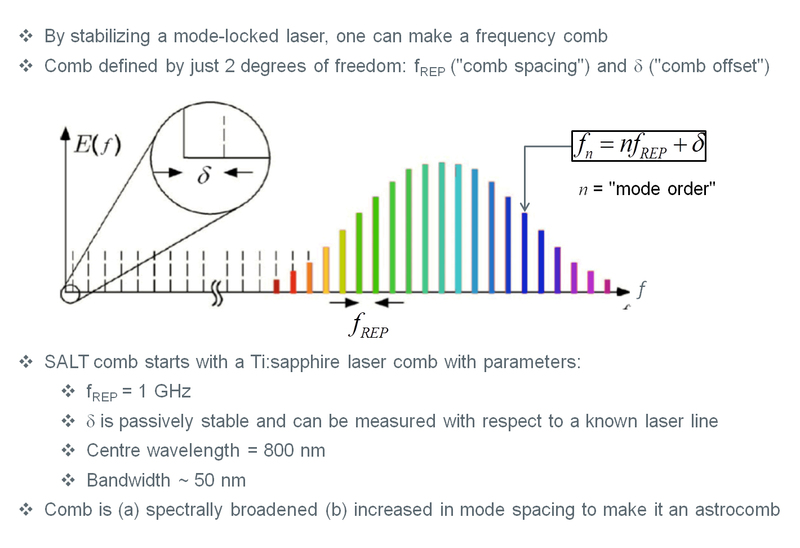 The ~30 cm round-trip path length of the Ti:sapphire laser cavity sets the repetition frequency (mode spacing of the comb) to just less than 1 GHz. 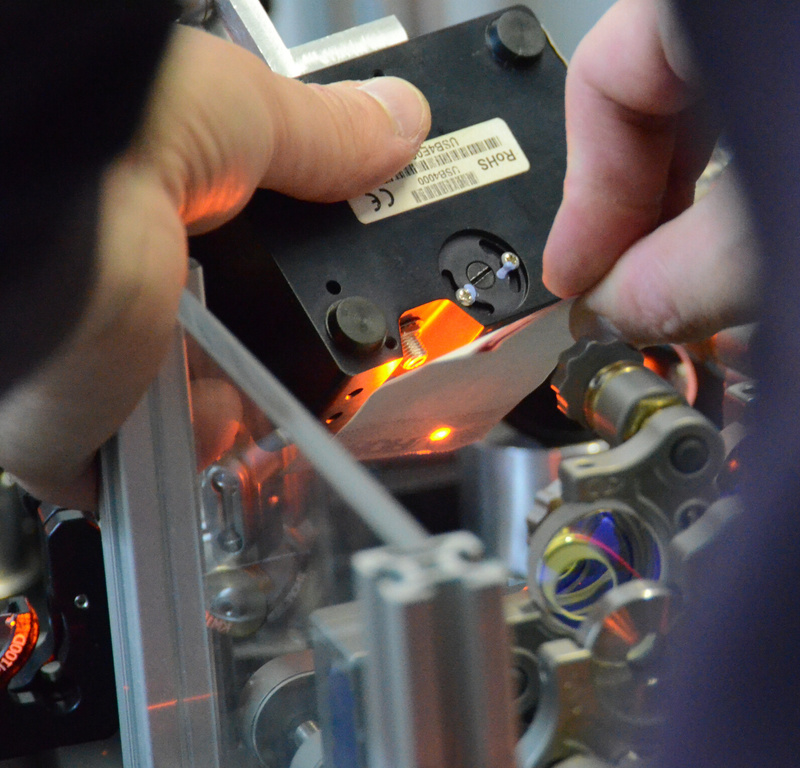 That 1.2 W beam is what's needed to make all the cool stuff happen, but there's quite a bit to be done to the light before we can fire it into our spectrograph. 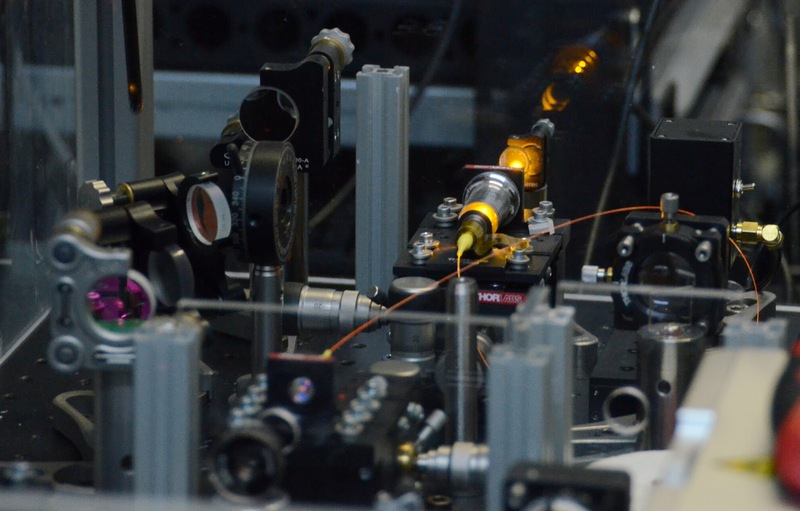 There's a third laser in the system - a continuous wave diode laser that produces a ~40 mW beam of red light (around 780 nm). 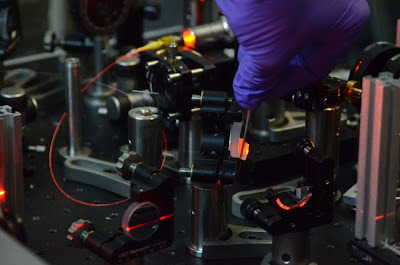 This passes through a rubidium gas cell & one of the resulting transitions (which are superbly traceable atomic references) is then used to lock the Ti:sapphire modes. The extremely well established wavelength of that line (780.24629 nm) also serves as a definitive reference point for our wavelength solution. 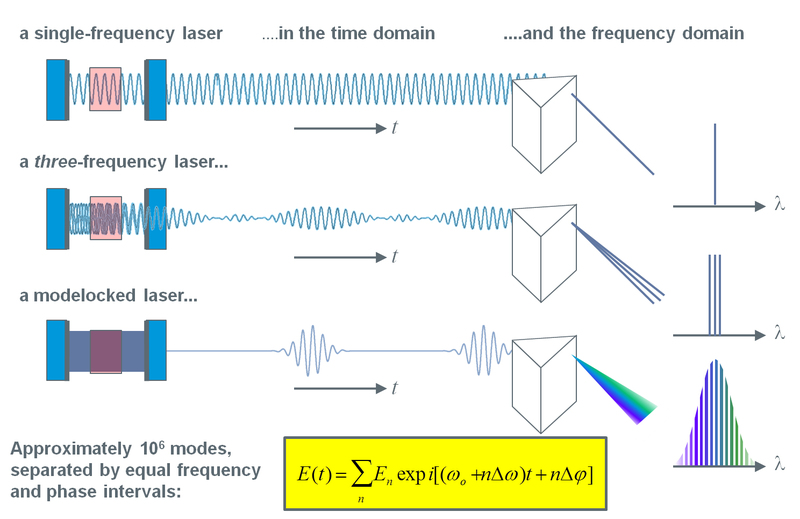 By measuring its exact position in our HRS spectra (to a minuscule fraction of a pixel), & then being able to count the comb teeth (whose separations in frequency space are exactly known due to the locked repetition frequency of the comb) will allow us to accurately map where each spectral feature is located in wavelength space. 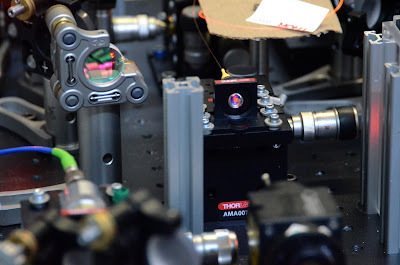 This is The Holy Grail of wavelength calibration, which is absolutely critical for high resolution spectroscopy, & particularly for the precision radial velocity measurements needed to detect low mass exoplanets. 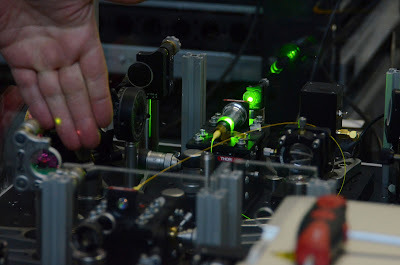 Of course all of this calibration work is Much easier said than done - but that's the principle anyway! The next critical component on the LFC's optical bench is the 50 cm long loop of photonic crystal fibre (PCF). 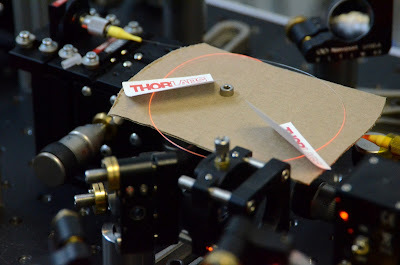 The core of this fibre is only about 3 microns in diameter so the rubidium & Ti:sapphire beams need to be carefully steered & aligned in order to couple them properly into the fibre input (the reddish spot to the right of centre in the pic below). The cladding of the PCF has an elaborate micro-structure with air holes. The holes reduce the effective refractive index of the cladding, which then improves the confinement of the modes & thus increases the intensity of the light within the fibre. 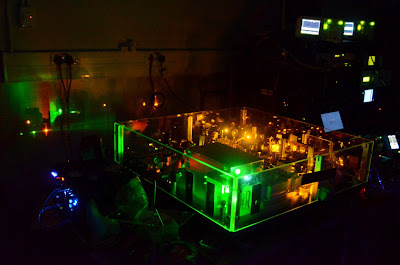 This high intensity is necessary to drive the non-linear process required to broaden the spectral range of the comb & to produce what's known as the super-continuum. One can literally see the colour of the light change as it traverses the length of this extraordinary little fibre! What looks like a continuous spectrum (similar to what one gets out of a spectrograph when you inject white light into it) is in fact made up of countless individual laser wavelengths - it's a rainbow of closely spaced laser spots! It's these spots that have immaculately defined wavelengths that can be used to precisely calibrate our high resolution spectroscopic data. 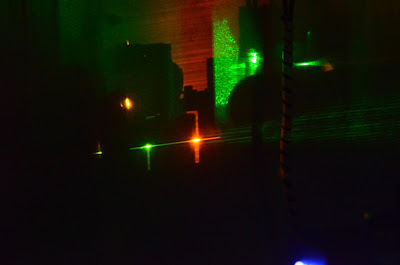 A tiny tweak of the fibre input turns the green beam from yellow, to orange, to red. The profound novelty remains, even after a week of playing with this! The last "sub-system" on the optical bench is the Fabry-Perot cavity. This device is basically a tunable filter that's used to knock out all but every 15th line, so that the comb's not too dense to be useful. A pair of partially reflective plane-parallel mirrors with complementary coatings are mounted on piezo-electric actuators that allow the spacing of the mirrors to be tightly controlled. 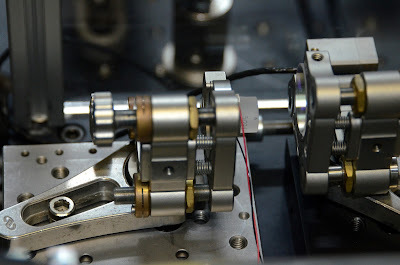 The mirrors first need to be optimally aligned using the precision micrometers that control the tip & tilt of the smaller mirror with respect to the larger, fixed one. The light bounces between the two mirrors & constructive interference leads to certain wavelength ranges being preserved (transmitted) & others being eliminated through destructive interference. 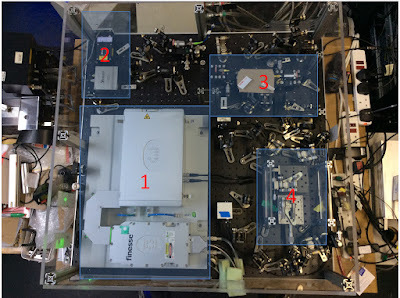 It's this filtered version of the comb that then gets directed to the injection fibre (the blue cable visible near the back of the bench in the pic below). That fibre is used to convey the comb light to the HRS high stability bench, where it gets introduced into the spectrograph in much the same way as the ThAr lamp light that's conventionally used for HRS wavelength calibration. Each of these units need to be locked to preserve the comb. 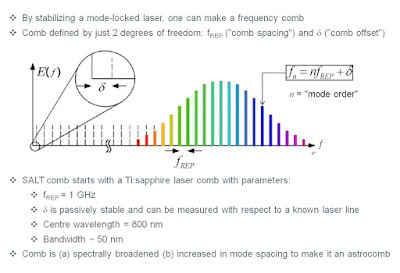 The Ti:sapphire laser is mode-locked, & then there are 3 electronic locks: the diode laser to the sharpest of the rubidium transitions, the repetition rate (the frequency that sets the spacing of the comb teeth) & then the Fabry-Perot cavity. With all of these locked & stable, we have a LFC that's good to go! The scene's even more spectacular when the room lights are switched off! More tomorrow about injecting the comb light into HRS! 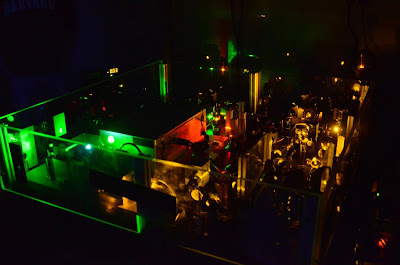 The LFC's horrifically complicated looking optical bench was set up on its pneumatic isolators, atop a thoroughly unpretentious old office desk that was dragged into the HRS electronics room for the occasion. 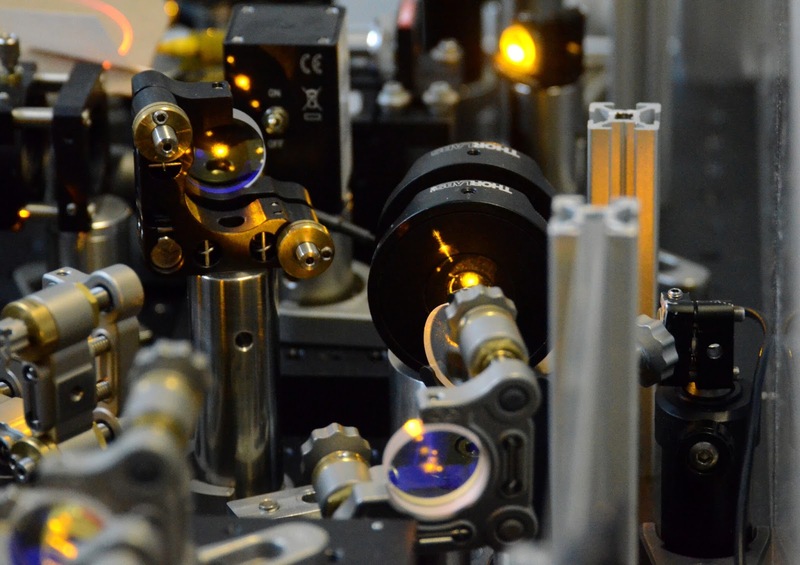 Some careful cleaning of the optics was in order, to remove dust that had accumulated during the packing, shipping & unpacking processes. A delicate task, expertly executed. 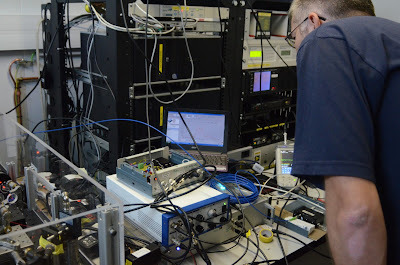 The array of electronics associated with the comb, much of it custom-built, is a formidable sight as well... Fortunately it's not usually necessary to directly access the HRS computers (visible in the background), instead we run the spectrograph from the SALT control room, or via a remote desktop connection. It's a good kind of chaos - really! Astronomers are forever scrounging for whatever light they can accumulate, so it's been bizarrely entertaining for us to operate in such a photon rich environment. 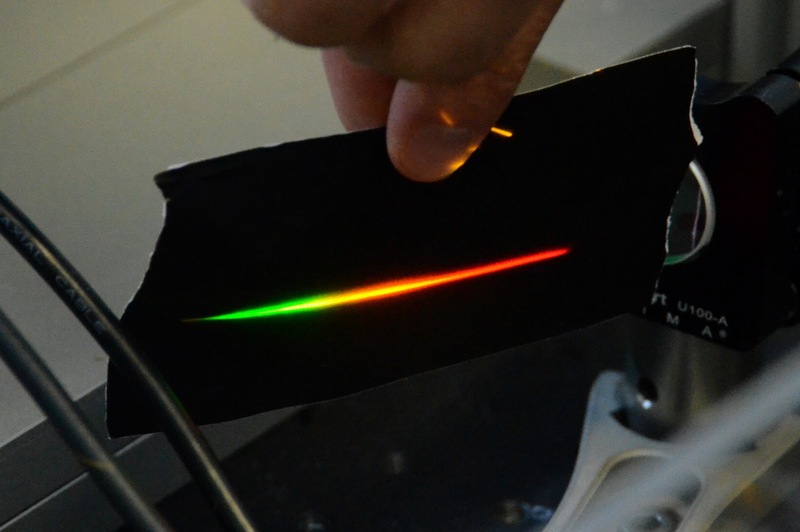 For example: to inject the comb light into the little bench-top spectrometer, & avoid saturation, one simply has to deflect part of the beam into the instrument with a piece of paper! Part of the fun is trying to trace the various laser beams as they criss-cross the optical bench, bouncing off of & passing through a multitude of mirrors, beam-splitters, polarisers, lenses & irises, before entering different fibres & detectors (including fast photodiodes & even a mini spectrometer). 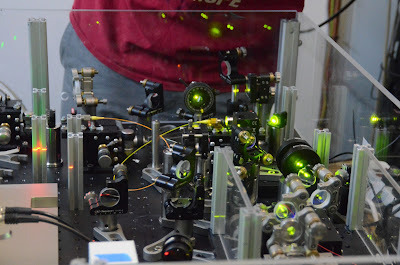 A Laser Frequency Comb at SALT! 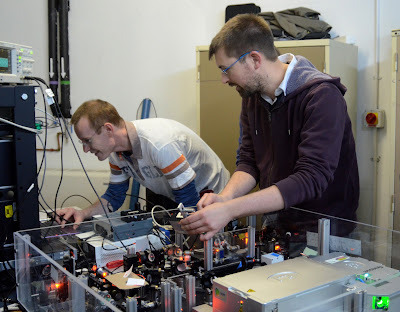 A week ago today we were joined at SALT by Derryck Reid (left) & Richard McCracken (right) from the Ultrafast Optics group at Heriot-Watt University in Edinburgh. 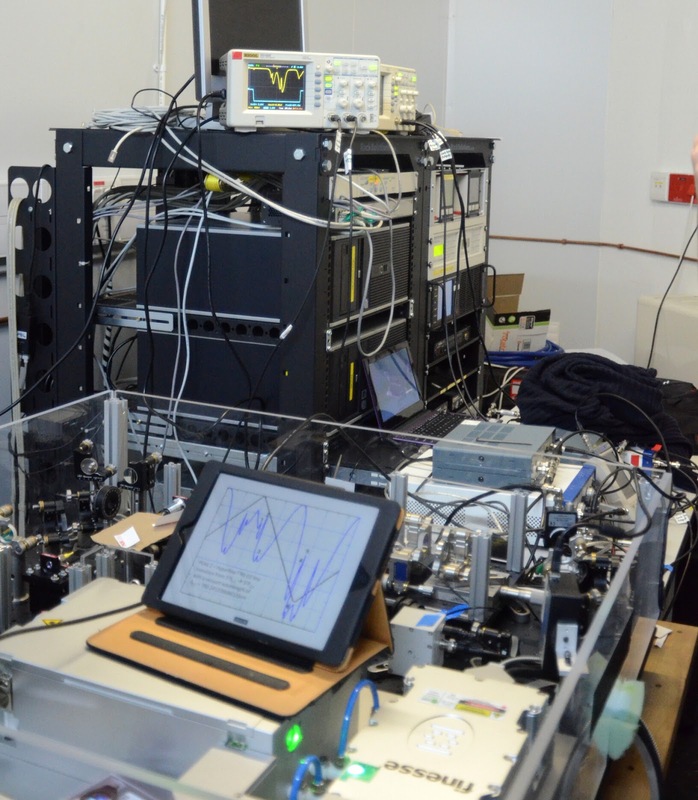 Their experimental laser frequency comb (LFC) had arrived in the country ahead of them & was safely transported up to Sutherland on 19 April. The plan being to set up & couple the comb to SALT's High Resolution Spectrograph (HRS) for a 3 month field trial. This project's hugely exciting for all concerned! 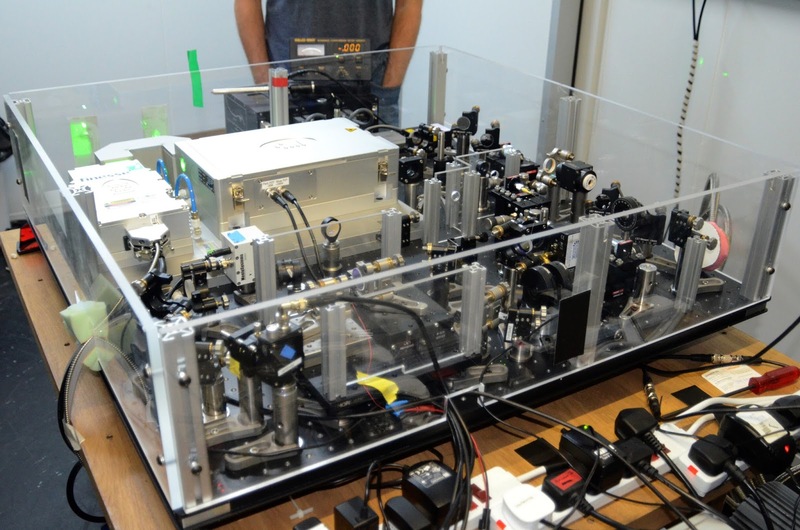 SALT gets to work with & learn about a state-of-the-art calibration device that will allow us to exploit the HRS's full potential as a precision radial velocity instrument. While the H-W team gets to test their lab instrument in a realistic operational environment, & obtain high quality astronomical data that will inform the refinement of frequency comb designs for astronomical applications. 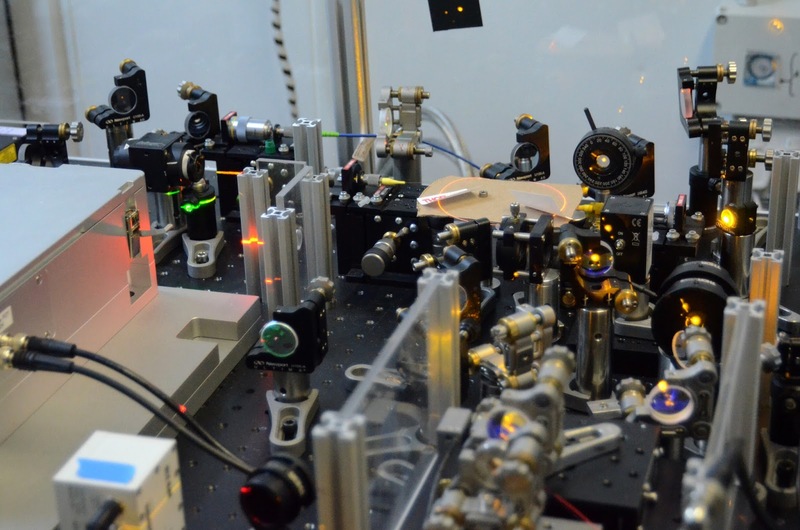 It's also incredibly stimulating & productive for people from widely different scientific disciplines to get to interact intensively in pursuit of such complementary interests. Given all that's happened in just a week, we're already all looking forward to what could unfold over the coming months & years! Others: Petri, Ant, Lisa, Eric, Nic, Rudi, Derryck, Richard. Another clear night (well, with some thin cirrus) and very nice seeing! Unfortunately we had to stop observing at about 1:30am due to a technical problem. Others: Eric, Rudi, Lisa, Nic, Derryck, Richard. Oh and Veronica and I casually broke the record for the number of science blocks in a single night, despite a late start due to high humidity and spending nearly 2.5 hours on engineering stuff... guys, the bar has been raised! Just to brag a bit more, here are the lucky winners! Others: Lisa, Rudi, Richard, Derryck, Nic, Eric. Others: Ant, Blaise, Eric, Derrick, Richard, Nic, Rudi, Lisa. Ted remotely for FP. Finally! A truly beautiful night with clear skies and decent seeing - such a pleasure! At least it was until the relative humidity suddenly zoomed up at 4:30am and forced us to close. Sniff. Others: Lisa, Derrick, Nic, Eric, Richard, Ant. Stormy weather followed by very wet conditions. No science data taken tonight either. Others: Blaise, Anthony, Lisa, Derrick, Richard, Eric. Another cloudy and humid night. Did some tests with the Fabry Perot system, but no science observations. Others: Blaise, Anthony, Eric, Richard and Derrick, Fred. Humid and wet conditions tonight. No science observations taken. Rained during the day but it cleared eventually, yielding decent seeing on this bright night. This bright night with some clear hours and some cloudy hours was used as best we could, thanks to the newly populated queue of ours. Rained during the day. Heavy cloud until midnight. Brief clear bit and then struggled through thick clouds. Sudden arrival of moonlit scattered clouds presented some challenges. Observed a polarimetry ToO that was added 04:00 p.m. Stable conditions with reasonable seeing once the night cleared up. It was put to productive use. Others: Marissa, Enrico, Sudhanshu, Elias, Teresa, Simon and visitors. A night with poor weather conditions : mostly cloudy. But a night extremely productive. Thanks to many programs that required medium to poor conditions, and to the size of our mirror that allows us to litteraly observe through the clouds, we have gathered a huge amount of data, for many different kind of programs, ranging from measuring the chemical composition of the first stars in our Galaxy to measuring the kinematic of gas in a (beautiful) galaxy located 4,5 mega parsecs (that is approximatively 15 million light years) from us: M83. A very productive night. Overall good conditions, and no technical problems. A productive night, with good conditions during most part of the night, and towards the very end, humidity had us close. We have passed for the first time ever the 1000 blocks observed during one semester! And there are three more weeks to go. The night started with excellent seeing : the first measurement was 0.68, and it stayed around 0.8 for most of the time we stayed open. But then, humidity forced us to close. No scientific data gathered tonight, the weather was particularly uncooperative. Very high wind at the beginning of the night, and then, humidity, and then clouds. Lost the whole night to high humidity and clouds, no science data taken. beginning part of the night. No "accepted" science data produced. A very nice clear problem-free night with sub-arcsec seeing.